The Society develops a collection of items relating to the environmental, social, industrial and technological history of the Flinders, Shoreham and Point Leo areas. Its headquarters are at the Shoreham Hall (the old Shoreham school) Byrnes Road, Shoreham. Members undertake the important task of preserving our local history and publishing the newsletter. New members are always welcome. Come along to the Shoreham Hall between 10.00am and 12.00 midday on the 1st and 3rd Monday of the month. To find out more go to the Flinders District Historical Society web page. To join, please complete this application form and mail it to the Society. It includes information on how to pay your annual membership fee - Full Membership $20, Concession (Over 80 years) $15 and Honorary Membership (over 90 years). If you are looking for information on the Shire’s Heritage Study Review, planned for later 2019, please click here. Flinders: Kennon Cove and West Head in the 1920s. The Cargo Shed has the bowed roof at the lower left. A very detailed article on The Cargo Shed at Flinders Pier with its interpretive display - now restored and open for inspection ! Our photo above is one of several in the newsletter showing the cargo shed at various points in its history. Articles on the Centenary of Armistice 2018 including a note on the contributions of Shoreham’s Callanan family. A report on the AGM presentation “Government Residence Melbourne 1837”: the Story of the Painting and the Flinders Connection. Special Snippets on Shoreham’s historical Signage Project and Buxton Chapel. Membership only costs $20 per annum. Fees go towards projects like the Cargo Shed, producing the newsletter, office costs and insurance. Prior to European settlement the clans of the Boonwurrung people used this area for summer living, fishing and gathering food from the shoreline. Numerous middens along the coast attest to this long pattern of habitation. Sealers and sailors were the first Europeans to make contact exploiting the natural resources of the area. 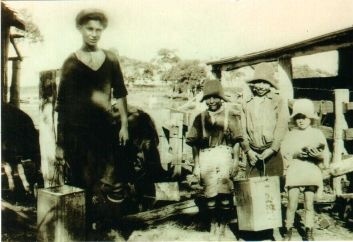 The permanent water available at Stony Creek in a sheltered cove was the natural place to anchor and replenish supplies. In December 1803 Lt. James Tuckey camped here with his small exploration party; they had walked from the Collins settlement at Sorrento. Following the establishment of the Port Phillip district in 1835, settlers moved into the area. In 1846 Henry Tuck took up the Manton’s Creek pastoral lease which covered all of the Shoreham area. He built a home for his family and commenced cattle grazing and farming. The Land Acts of the 1860’s broke up the large leases and made small acreages available for purchase. A group of Irish Catholic families came to the Shoreham/Balnarring area in the 1860’s. Many had tried their luck on the goldfields and marriages had taken place between the families in Tipperary and Melbourne. Among them were the Byrne, Dowling, Kennedy, Nowlan, Ryan and Riley families. Martin Byrne's family sold the lower paddocks of their dairy farm to Walter Henry Buxton, a printer and estate developer from Melbourne, who subdivided the land and promoted the sale of the 'Shoreham-On-The-Sea' estate in December 1923. Final subdivision of the upper portion took place in 1969. Find out more about Shoreham's history by taking a walk following one of the Heritage and Discovery Walk guides you can pick up at the Post Office or view here.